Pupils from the Nesting and Sandness primary schools are being joined by Shawney Henderson of Edinburgh Science Festival (front row left), Jenny Wink of Shetland Gas Plant (back row left), Lizzie Leask of Total E&P UK (back row right), Sophie McCabe of Edinburgh Science Festival (front row right), and Shetland MSP Tavish Scott. AROUND 650 primary school pupils from across the isles have been learning about energy consumption and renewable energy thanks to an engaging science show laid on by Generation Science and sponsored by energy company Total E&P UK, the operator of the Shetland Gas Plant. The ‘Smart Grid’ science show discovered how smart grids allow electricity consumption to be switched on and off based on demand, and looked at renewable and non-renewable energy generation. Using exciting experiments and dynamic demonstrations, pupils uncovered the implications excessive energy consumption can have on our environment. They also learned how moving magnets past a circuit produces electricity, and about generators and turbines. The first of the shows got under way at the Nesting Primary School on Monday last week. Smart Grid is one of 15 shows and workshops provided by Generation Science designed to make science fun, exciting, easy to understand and to help teachers cover the school science curriculum. Generation Science manager Joan Davidson said: “Thanks to our supporters Total E&P UK we were able to spend a week in Shetland this term, educating young learners about the wonder of science and its real world applications. The largest science education outreach provider in the UK, Since Generation Science has reached well over one million pupils in Scotland since it began touring over 25 years ago. This year Generation Science will visit over 600 schools in 31 local authority areas from the Borders to Shetland. 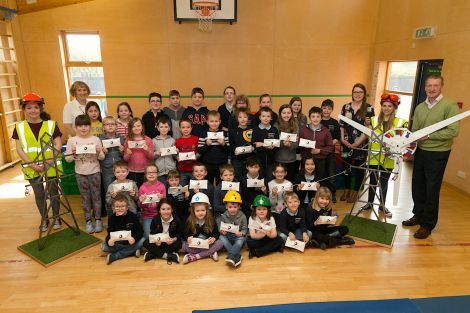 Shetland Gas Plant manager David Wink said: “Supporting initiatives that bring science, technology, engineering and math learning to the classroom is an important part of Total E&P UK’s educational programme. “Transferring our knowledge through these workshops will help children understand the important role that science plays in our every day lives. Generation Science is organised by the Edinburgh International Science Festival Foundation. Total E&P UK Ltd is one of the largest exploration and production subsidiaries of the TOTAL Group. It operates the Alwyn/Dunbar area in the northern North Sea, the Elgin/Franklin area in the central North Sea and the Laggan-Tormore hub in the West of Shetland area.